The Northern Ireland Human Rights Commission (NIHRC) visited Coalisland on Monday 21 May to meet with local Traveller support groups and organisations as part of its ongoing engagement work. The visit was facilitated by StepNI and the Promoting Wellbeing Team of the Southern Trust, Health and Social Care NI. The Commission’s investigation report into Travellers’ accommodation was published in March this year. Since the publication, the Commission has put in place an implementation plan to pursue the recommendations in the report. As a result, the Commission has continued to engage with relevant public authorities, Travellers, and Traveller support groups to resolve the issues identified in the investigation report. 1. 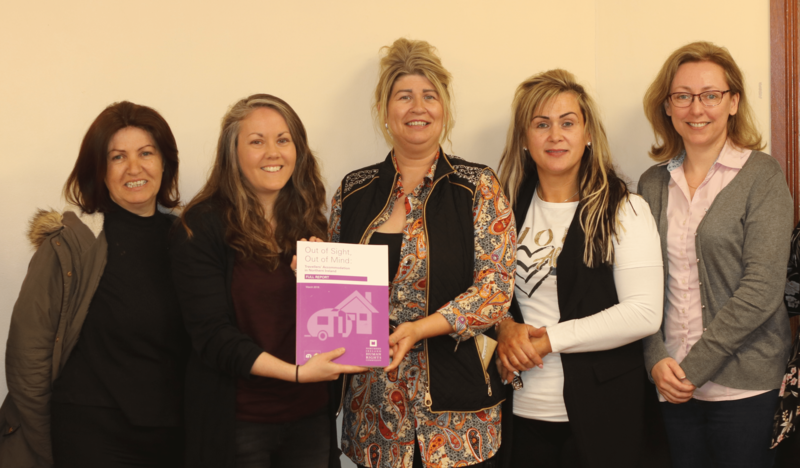 The Commission’s ‘Out of Sight, Out of Mind’: Travellers’ Accommodation in Northern Ireland’ report was launched in Belfast City Hall on Tuesday 6 March 2018.